South Africa coach Peter de Villiers has drafted winger Odwa Ndungane into his side to face Australia in Brisbane on Saturday. The Sharks' speedster takes the place of the injured JP Pietersen in the only change to the starting line-up that destroyed Australia in Perth at the weekend. 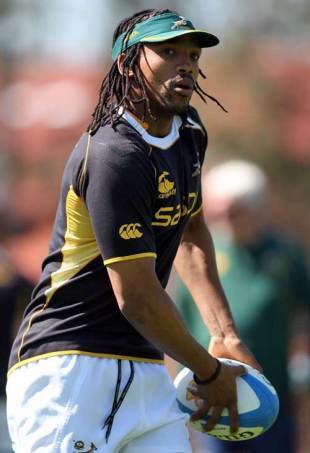 The match will see Ndungane, who last played for the Springboks in the final Test against the British & Irish Lions in July, earn his fifth Test cap. Pietersen (hamstring) was sent home yesterday alongside replacement lock Andries Bekker (shoulder). Versatile forward Danie Rossouw has been added to an otherwise unchanged Springboks bench for Saturday's clash at Suncorp Stadium. In related news, Sharks lock and captain Johann Muller will join the Springbok squad in Australia as a replacement for Bekker. Muller, who has been capped 23 times for the Boks, last played in the Green and Gold in the third Test against the British and Irish Lions in Johannesburg in July. De Villiers said that including Ndungane had not been a difficult choice. "Whilst we have a lot of versatile players in the squad, Odwa in the natural winger and therefore was the first choice. He has been running the moves with us for sometime and is familiar with the defensive patterns so he should fit in pretty easily". Addressing media in Brisbane, De Villiers was cautious about his team getting ahead of themselves. "We have not won the Tri-Nations title yet and there are still two tough games to play. We are focusing on the immediate task at hand and that is to do well against Australia on Saturday." The coach was also asked what it would mean if the Boks were successful in winning all six of their Tri-Nations clashes. "We are trying to be the best that we can be. We do not chase records but strive to improve on each and every performance. This team can still get much, much better and is playing winning rugby whilst still making errors. It excites me when I think of what these players could still do on the field," he said. The match will mark the 50th Test appearance for centre Jaque Fourie, who is the fifth player after Schalk Burger, Bryan Habana, Jean de Villiers and Fourie du Preez to reach the milestone in 2009. "It is a fantastic honour to represent your country and I am looking forward to getting my 50th cap," he said. "There are a lot of guys in the squad now who have reached 50 and several others who are in the 80's which brings great experience and composure to the team. The spirit is great in the camp and the guys are eager to do well at the weekend." De Villiers also confirmed that concerns over minor ailments to Bakkies Botha and Bryan Habana had eased and that both players would be ready to fill their places on Saturday. South Africa, who have not won in Brisbane in six attempts since their reinstatement in 1992, need a solitary bonus point to seal their first Tri-Nations crown in five years.